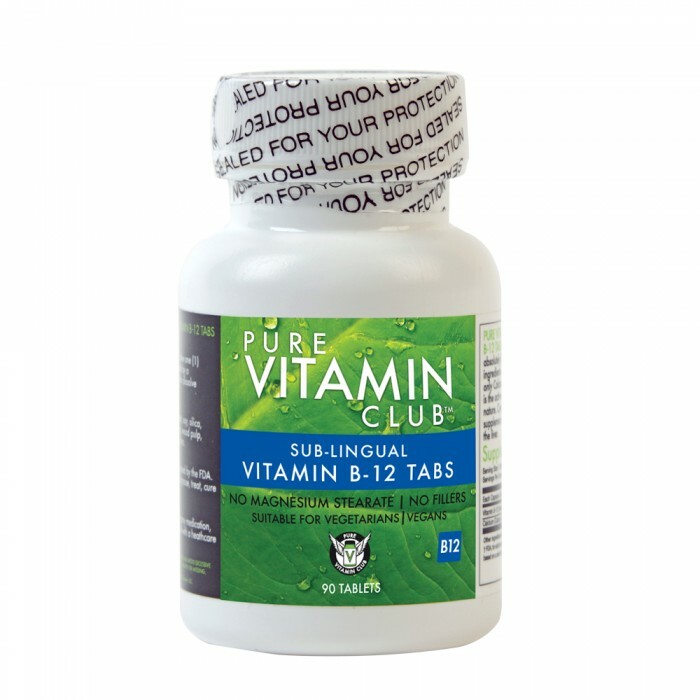 Pure Vitamin Club’s Sub-lingual B-12 Tabs are the only sublingual B-12 supplement that doesn’t contain binders and fillers, and delivers 2,000 mcg of Methylcobalamin (the B-12 form nature intended) directly to where it’s needed by dissolving tastelessly under your tongue. What makes our B-12 different? 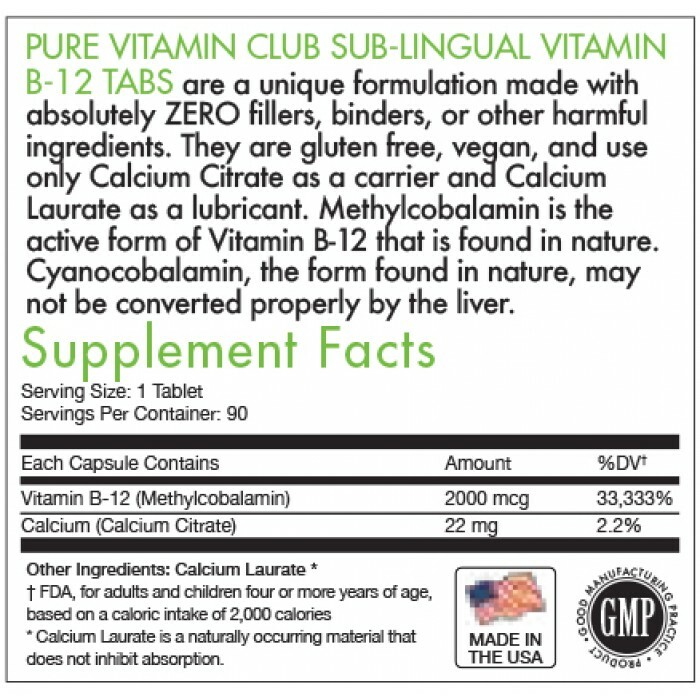 No cyanide: many commercial B-12 supplements use an artificial, laboratory-synthesized version of B-12 called cyanocobalamin. As the name suggests, this unnatural form of B-12 contains a cyanide molecule…not something you want in your vitamins, We use the natural B-12 form, Methylcobalamin, which is more easily absorbed. No sugar or artificial sweeteners, flavors, or colors: We make vitamins, not candy. Sugar is bad for you, as are artificial flavors, sweeteners, and colors. You won’t find any of these in our vitamins. Includes Calcium: We created our B-12 sublingual with only three ingredients: Methylcobalamin (B-12), Calcium Citrate, and Calcium Laurate, a natural lubricant that combines calcium with lauric acid, a medium-chain triglyceride found in coconut oil which is known to have anti-microbial properties. So you’re getting a bonus nutrient (Calcium), and no BS. 5 bonus tablets: since we don’t use any of the binders found in most other tablets, our tablets may break more easily. So, we’re giving you 95 tablets in every 90 count bottle, just in case. Vegan friendly: vegans do not get Vitamin B-12 in their diet, and must supplement this vital nutrient in order to be healthy. Since we don’t use Lactose as a filler, our B-12 is vegan-friendly! What are some of the symptoms of B-12 deficiency?